Hresil tries to keep the trail warm as she and others search for leads that will bring to justice the killer of her son, David. Standing on the same sidewalk at 60th and Springfield where David was gunned down, Monica Hresil once again appealed to the public for help—any help—in providing information regarding who shot her 18-year-old son. She did so on Saturday, May 7, a day before Mother’s Day. 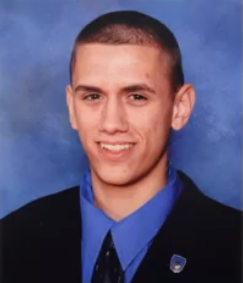 David Hresil was a senior at St. Rita High School—an ordinary guy, a neighborhood kid, by all accounts--when he took two CTA buses home from school on the afternoon of Thursday, Jan. 8., 2009: first a westbound bus on 79th Street and then a northbound bus on Pulaski. He got off at 59th Street and walked east towards home. Monica Hresil bows her head during a prayer last Saturday. At about 3:30 p.m. on a sidewalk near the northeast corner of 60th and Springfield, he was gunned down by an assailant who fired several shots. Witnesses described the shooter as a Hispanic male about 5-foot-7, wearing a black jacket with a white logo. The killer then ran north on Springfield on the east sidewalk, jumped into a vehicle described as a 1990s, four-door, burgundy or maroon Chevy Suburban, which sped away west on 59th Place and then north on Springfield. Offering support to the Hresil family Saturday were a handful of mothers who also lost sons and daughters to violence. They belong to Chicago Survivors, a not-for-profit group that provides a range of services to people who have lost family members to homicide. The group’s founder, Joy McCormack—who lost her son, DePaul University student Frankie Valencia, to random gun violence in 2009—spoke briefly at Saturday’s event, moments after a prayer offered by the Rev. Thomas McCarthy of St. Rita High School. Moms from the Chicago Survivors organization. The group’s website, chicagosurvivors.org, and toll-free tip line, 1-800-UTELLUS, are designed to assist families dealing with loss as well as collect information that can lead to crimes being solved. Saturday’s event—the sixth such event held at the crime scene since 2009--was led in part by Cook County Crime Stoppers, a not-for-profit organization that since 1985 has offered cash rewards up to $1,000 for tips that lead to arrests and convictions of those who commit crimes. McDade encouraged everyone with any bit of information about the crime, no matter how small, to call Crime Stoppers at 1-800-535-STOP. Callers may remain anonymous, yet still collect a cash reward if their tip leads to an arrest and conviction—because they will be given a code number. Tips are shared with law enforcement for follow-up. For more information, visit cookcountycrimestoppers.org. Every time the group has fanned out across the neighborhood, leads have been generated, McDade added as he thanked volunteers for their tenacity and told them not to be discouraged. A mom shouldn’t have to cry on Mother’s Day. But Monica Hresil did--or at least she did a day earlier, on a cold, windy Saturday last week as she stood on a sidewalk at 60th and Springfield. The same sidewalk where her son, David, lay bleeding after he was gunned down by some cowardly thug on a January afternoon in 2009. I know that neighborhood. I grew up in the Gage Park area and spent a lot of time as a girl going up and down 59th Street, back and forth to West Lawn and West Elsdon, visiting family friends and attending Lourdes High School. away from that sidewalk, for seven years, when we were a young married couple—three houses east of 59th Place and Springfield. With our first daughter in a baby stroller (a little girl just eight months younger than David), talking with joy and optimism about our little girl’s future, we occasionally walked the same stretch of sidewalk where David would later lose his life—and Monica would lose her baby, so to speak. I write this merely to make my connection a little more clear, to give a sense of why I shudder perhaps a bit more than most when I think about what happened to young David. I’ve shed tears thinking about it. Perhaps you have, too. What happened to Monica Hresil and too many other moms like her is a depth of pain I can’t fully understand, if only because—fortunately for me—I’ve never had to bear the soul-searing pain of losing a child you carried for nine months, nursed, fed, cleaned, tucked into bed, sang songs to, read stories to, kissed, hugged, cuddled and—well, you get the idea, especially if you’re a mom. David, a senior at St. Rita High School, was an ordinary teenager looking forward to the rest of his life. In the flash of a pistol, he lost that, and his family lost him and his future. He would never fall in love and get married, never smile with pride as he placed grandbabies in Monica’s arms, none of that. So what does that mean for the rest of us? Other than grind our teeth and shake our fists at how unfair life can seem, what can we do? If you know Monica or anyone else in a situation like hers (and sadly, the numbers grow each week with newly-committed homicides), offer and deliver comfort—everything from words to a hug to taking the person out to dinner, you get the idea. Beyond that and in a larger sense, let’s all commit ourselves to refusing to put up with crime, even crimes that are years old. If we truly hope to build and maintain a community, we must understand that a crime against one is a crime against all. So spread the word about the crime committed against David Hresil and his family. Encourage people with information—no matter how small--to call Cook County Crime Stoppers at 1-800-535-STOP. David’s case is cold at this point, but these types of cases can (and do) break open and get solved with the slip of a lip (or a confidential tip) by someone somewhere. I know I won't forget, and as a journalist—and yes, a mom--I’ll help to keep the fires burning for justice until the killer is caught, charged, convicted and sent away for a long time. A balloon release for David.